This was my first Christmas out of the country. It was very different with warm weather and palm tree's. 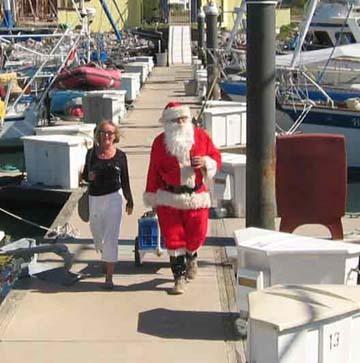 We still had Santa Claus show up as well as a lot of cruising friends for a Christmas dock party. We had our Christmas hats on but we also had shorts on. I also got to wear my new gold ear rings that Royce got me. We plan on heading farther south once we get our FM3's (visa's) renewed. Next stop will be Isla Isabella about 80 miles south as the booby bird fly's. Well we're back on the Baja side once again. After being in San Carlos for almost 3 months we finally were able to slip the mooring lines off and sail away. It was good to get back out there once again. While in the yard we added a 110 lb. bruce anchor. I'm looking forward to testing this out. I'm going to be much more comfortable with a big anchor. We did have a problems with dragging. We were just to heavy for the anchor we had. So far the couple of times we have used it it's worked great. Of course we haven't had any really heavy winds yet. I'll keep you posted. We arrived at San Carlos Marina at 1700. The wind was to our advantage and we made great time. We set the sails and left them all the way over. It was a great trip. The bad thing was, due to all the high winds the last week or so the waters were very confused. It made for a very bumpy ride. I put on one of my scopolamine patches and got thorough the trip with out any problem. Upon our arrival we were able to get a slip at the San Carlos Marina. It was very nice to plug into shore power again. We stayed in the slip for three days then we moved over to a mooring ball. It was nice being connected to land but much nicer out on a mooring ball. The cost was better as well. The slip cost us $25.50 a night and the mooring ball only cost $3.17 a day. We have a haul out date here for July 30th. Royce has a long list of things we need to get done. I will be heading back home for a week to see my Mom and check on a new Grand baby. While I'm gone Royce will be getting the bow spit anchoring system rewelded. The anchor we have is just not big enough for our boat. We currently have a 65 lb. bruce. It works but takes more work to get it set then it should. Royce bought a 110 lb. bruce to replace the 65 lb. The bigger stock will take a bigger opening on the bow spit. We have already talked to the welder at the yard. They charge $30.00 an hour for the welder. The question now is how long will it take him to complete the work. In Mexico nothing happens fast. We arrived at Isla San Marcos early enough in the day to do a little snorkeling. We went over to a reef with Dennis and his spear gun to get some dinner. I spotted 2 lobsters that Dennis was able to spear. Along with the fish Dennis speared and one more lobster we had a great dinner. It has become a regular daily thing to go snorkeling. It's great fun and great exercise. I think I've lost some weight and what a better way to do it. We got a group together and we took the dinghies over to the town of San Marcos. This town is a company town on the Isla of Sam Marcos. You have to be employed by the company to live there. They have everything a regular town has. It's a very clean and happy community. We ended up walking to the end of town where they had a little league baseball game going on. It was fun watching the little guy's playing baseball. I don't know how they could play in that heat (90's) but it didn't appear to bother them. I guess when your born into it, it's not so bad. This Island is a mine for gypsum. They have a huge operation. They must pay well cause every house seemed to have a air conditioner. That you don't see in most of the towns we have been in. Last night at about 2am we were woken up by high winds. We were anchored between Wild Flower and Two Can play. With all the wind our anchor stretched and we got a little to close to Wild Flower so Royce decided we needed to move and reanchor. Boy that is not a fun thing to do. Pulling anchor wasn't to bad but trying to get the anchor back down in 30 knots of wind was not fun. After about 4 try's we got it to set and we were back in bed by 4. Well I was back in bed, Royce decided to sleep on deck in the hammock. I don't know what time he finally got to sleep. Today we are just going to lay around the boat and read. I will also be putting everything away so we can get underway in the morning. We plan to head out to San Carlos at first light. This will be a 14 hour trip and we have to make sure we get there while it's still light out. One more holiday down since here in the Sea of Cortez. We had a great party at Burrow Bay. There is a large American population living there. One of the guys that has a palapa on the beach is named Gerry. For the last 7 years he has had a big 4th of July party. This year there were 14 boats anchored in the bay. Between the cruisers and the locals there was a lot of people there for the party. Lot's of cruisers we hadn't seen in a while. The party went on till dark , then there were fireworks, hot dogs , apple pie and good friends what more can you ask for. We spend today relaxing and snorkeling. A group of us went to Dead Dog Beach (this is the local Island pet cemetery) and had a very nice snorkel . There was 4 dinghies with 10 people. One group was a family of 5. The youngest was 13. They were in the Sea for a 3 week vacation on there boat. I broke a pen scallop open so the youngest could feed the fish . It was fun seeing the kids feed the fish. The Sgt. Major fish are a lot of fun to watch, they are small yellow and black stripped fish and run in schools. They will dart in and out taking off small bites of the food. They are quite the clowns and very entertaining to watch.. There you are swimming in a school of bright colored fish that are feeding out of your hands, it's very cool. From here we will be heading to Isla San Marcos with Two Can Play with Dennis and Susan, and Wild Flower with Lynn. We are currently in the Bahia Conception area. It only took us 6 months to get here. Every place we go is so wonderful that we kind of get stuck there. We got to Puerta Escondito and liked it so much we stayed over 2 months. It was the same with LaPaz. We will heading over to San Carlos and I'm sure we will be there at least a couple of months. There is just so much to see and do. While we are here in Bahia Conception we will visiting all the Islands (and there are a lot of them). We have already gone snorkeling on 3 of them. The water clarity is getting better and we have been doing a lot of clamming . There are tons of clams and they are so good. The fishing is not great right now. There have been 3 other boats with us, Two Can Play, Que Tal Wild Flower and Wanderer. A couple of the boats go out almost every day to fish. So far they haven't gotten anything big enough to eat. We did have another couple (that live here full time) over to dinner and they brought us a jar of canned sail fish.. They said they though it tasted kind of like canned salmon I'll have to figure out how to serve it but I'm sure it's going to be very tasty. We haven't been doing any diver since the dive compressor broke. With all the tank fills I ended up doing for the Cat's Meow rescue the compressor broke. We got a hold of the company and had them send parts down with another boat that was heading this way. We got the parts last week and Royce will work on it soon. The big thing Royce has been working on is the water maker. We have only had it back from the last time it broke for a very short time. Royce has taken it all apart again and he thinks it's the low presser pump again. We have emailed the company and hope they respond back soon. In the mean time we are not using water very sparingly. There has been a lot of excitement here the last couple of weeks. We went to the hot springs with 3 other boats for some warm water and beach coaming. After a great day spent on the beach we went over to the boat Cat's Meow for dinner the Cat's Meow is a 52-foot custom converted fishing trawler that had been made into a beautiful spacious home for her owners Martin and Robin Hardy. On May 18 there were 3 boats that left Puerta Escondito Mexico with Cat's Meow, RDreamz with Royce and Pam Hagerman, Cat House with Joe and Vicky, and Qai Tal with Dave and Caroline Shearlock. We had planned to go to the hot springs for a day or two of beach coaming and playing in the water. The water was warm and the beach was sandy with lots of cool stuff to look at. We were all invited back to Cat's Meow for a dinner of clams and spaghetti. Before dinner we got the grand tour of Cat's Meow and it was spectacular, with living spaces bigger then most apartments. Martin and Robin live on the Cat's Meow with their two cat's Toes and Squeaks and have been in the Sea of Cortez for the last 3 years. In November 2003 the Cat's Meow was credited with saving a number of boats by pulling them off the rocks during hurricane Marty. But now it was time for other cruisers to come to the aid of Cat's Meow. With the evening festivities comeing to a close we got in our dingy and headed back to RDreamz. We had turned off the radio so we could sleep in late, so we didn't hear the call when Cat's Meow went on the rocks. At about 2100 we heard a dingy coming up to the boat and Caroline and Dave yelling that Cat's Meow was on the rocks and needed dinghies to help push her off. We got into our dingy and headed over to Cat Meow's anchorage. The wind had picked up and was blowing in the 30-knot range. There was no moon and it was very dark. We found Cat's Meow straddled on a rock not to far from the area we had left them in earlier. We were told that when the wind picked up Martin was not happy with the holding of his anchor and was going to go out farther to reanchor. In turning around in the dark he didn't see the rock and ran over it. We got the 3 dinghies together and tried to push Cat's Meow's stern off the rock. With Martin's engines going full we still were not getting any place so it was decided at this point to get RDreamz to pull her off. By the time we got the anchor up and got to Cat's Meow the tide was going out and Cat's Meow was higher up out of the water. We got a stern line attached and tried to pull this 40-ton troller off the rocks. Because of the 30 knots of wind and the rocky area it was necessary to use the dinghies as bow thrusters on RDreamz. As the tide went out farther RDreamz was pulled closer and closer to the rocks and ended up hitting the rocks twice. Luckily RDreamz was able to power off the rocks and was not damaged except for a little less bottom paint on her steel bottom. At this point because of the danger to RDreamz the towline was cut loose from Cat's Meow and we went and anchored. With the tide going out fast Cat's Meow was starting to heal over very badly and started to take on water. As she healed over onto her side Martin and Robin grabbed there very up set cats, important papers and the close on their backs and abandoned ship. Since RDreamz had the most room on board we invited them to stay with us. While all this was going on Caroline from Qui Tal was putting out a call for help for anyone in Puerto Escondito with pumps to help pump the water out. By this time it was 1 am and we got no response. With no response we then tried the Mexican Navy. There response was that they would have a ship to our location in 5 or 6 hours. We found out later that Ted and Billy McArthur on Sabado in Escondito had heard our call and responded back to us but we could not hear them. They heard the information we gave the Navy. We gave our location and that we needed pumps and help to get Cat's Meow off the rocks. Billy then called Elvin and Connie who has the panga Sea lover and access to the big pump owned by the Hidden Harbor Yacht Club in Puerto Escondito. It was dark, windy and 3am but Elvin and Connie along with Ted from Sabado got the pump from the Yacht club and headed to our location in the panga Sea lover. This was a 1-½ hour trip in the dark and we were never so glad to see anyone before. The pumps were hooked up to try and keep any more water from rising in Cat's Meow but it just was not working. Several cruisers put out the word that Cat's Meow was in trouble and our location. In less then 5 hours we had over 20 boats there to help. Since RDreamz had the room we took Martin, Robin and there two cats on board. RDreamz also started handling all the water/diesel soaked items taken off the Cat's Meow. When there was no longer any room we put out the call that we needed some place to store things. Several boats stepped forward and made room on their boats for Martin and Robins possession that we were able to save. As the day went on, RDreamz used up what bread, eggs, tortillas and juice we had on board feeding the work crew. When we ran out we put the word out that we needed help. The donations came in from everywhere. We had a group of ladies from several different boats volunteer to do the cooking. The work was hard and the heat was brutal but the ladies always had food and water available. They also delivered to the work site and always had a smile, it really made you feel better knowing they were there helping. With out them the workers could not of continued working to raise Cat's Meow. Not only were they feeding the 20 or 30 cruisers working on the boat but they feed the 30 Navy personal that were there working. The navy had several divers in the water and placed the lines needed to do the next tow. The next step was to get the biggest poser boats we could find with the most power and have them pull bow and stern at the same time. Two big power boat stepped forward, Reel time and On-line were hooked up to the tow lines and as soon as the tide came in to help float the boat a little better they pulled and pulled but Cat's Meow never budged. When this didn't work the Navy stepped in and agreed to pull the boat. The Navy had a large 150-foot boat that they hooked a very long towline onto and tried to pull the boat off. The only problem was the line was old and very used. The line broke 4 times before they decided to pull out a newer towline. The problem with the new towline was that it did not float, this added to much weight to the line. The Captain of the Navy ship asked the cruisers to bring their dinghies to the line and hold it out of the water. They place each dingy 150 feet apart. Once the ship was in position and the line was ready everyone was told to clear the area and the Navy started pulling again. This time the boat came off the rocks. It was a great site but not we had a boat full of water in 30 feet of water and not enough time to get the pumps working. It was decided to tow her to shallow water to make the repairs. Once they got her towed to the shallow water and the divers went down to check the bottom they found a hole in the bow and a hole in the keel. There was no way of getting the water out till we got those fixed. Again the call went out for supplies. We needed barrels and other flotation devices to help get her off the bottom so the repairs could be made. Every boat donated their fenders to be used. One of the boats in Puerto Escondito loaded up his truck with 10 50-gallon barrels that he borrowed and drove them to the site. He did some real off road driving to get them there and they were really a welcome sight to see. The divers attached the fenders and barrels on the sides of Cat's Meow and then we waited for a low tide. It was nerve racking and there were a couple of faults starts but finally at 0500 the tide went out and the pumps were able to get the water out faster then it was coming in and Cat's Meow was floating higher and higher in the water. Once she was stabilized and a towrope was attached to Sabado, Cat's Meow started her trip back to Puerto Escondito. The weather was great and the tow went with out any problems. In less then 2 hours she arrived back to Puerto Escondito, the lines were released and Cat's Meow was docked to the sea wall at the harbor. It was a great to see her underway again and even better to see her tied to the wall. There was to be a lot of work still needing to be done before she was ready for the tow to LaPaz to be hauled out for repairs. The temporary patches had to be reinforced and more cleaning had to be done to her interior. In less then a week with all the cruisers working on her she was ready to go. Martin and Robin have a lot of work ahead of them to get Cat's Meow back to her glorious condition from before the accident. It will take time and money. One of the unfortunate parts of this story is that they had no insurance on Cat's Meow. The area is so beautiful. The land scape reminds me of the Grand Canyon area. Hugh red and brown mountains carved by winds and long past seas. The water's are emerald green. When you look down from the hill's the water and the land scape just takes your breath away it's so beautiful. How many times can you write something on February 29th? I just had to put it on paper. Since were retired the days just sort of sneak up on us. We have been in La Paz Mexico for 3 weeks. Royce had to fly home to do some work with the business. We got the boat settled into the Palmira Marina before he left. It was on the expensive side. Cost more then our slip in San Diego, but with the Captain gone I wanted the boat secured. It was hard having him gone. I was really glad to get him home. La Paz is a great town. I really like it here. There is lot's of stores and there all close by. The restaurants and nice and not to expensive. We have found there is a large American population here and I'm not surprised. I wouldn't mind staying here if we were done traveling. I really like the people. Everyone is so friendly and helpful. It's almost like being in a small town back in the states 20 years ago. While Royce was gone, La Paz had their Carnival. I went into town and checked it out. It was very small and reminded me of something from the 50's. There were several home made arcade booths. The one that really got my eye was the BB gun shooting gallery. They had taken dowels and put little metal ducks ,deer and birds on the dowel. The counter was only 3 feet from the dowels so you had to stand a couple of feet back from the counter to shoot. The guns were regular pump action BB guns. If you weren't paying attention you could walk in front of the shooter and get a BB in the ear. I saw one kid shooting at the targets from behind another kid that was shooting at the target. Needless to say I didn't stand around watching very long. There were lots of food booths but very little refrigeration. I'm sure the food was just fine as there was always a lot of people at the booths but nothing really looked that appealing. I had hoped for some booths offering hand made goods but there were more kids toy's from Taiwan then anything else. Since Royce came home we have gotten everything he brought back from the states put away. I have all the bug screens for the doors and hatch's done. Royce still has to install the big dingy wheels on the dingy. We have small ones on the dingy now and found that when you get ashore the wheels dig into the sand. When you take the dingy up on the beach you have to pull the dingy out of the water. Our dingy is very heavy so you put the wheels down before you get to the beach and then it's easier to pull out of the water. I'll let you know how the new wheels work. Well it's almost time to head south. Now that Christmas is over and the boat is almost ready to go I think I'd better write something for the web page. It's 4pm December 28 and the temp. is 64. I know I can't really complain since it's snowing almost every place else, but I'm cold. When we woke up this morning it was 39. This is sunny California and it's not supposed to be this cold. I am so ready to head to warmer weather. Our first Christmas on the boat with-out family was different but we did have a lot of friends around to make up for it. Our friends from Northern Dream, George and Helen Carter are like family so that helped. We had a great Christmas Eve dinner with George, Helen, Christopher and Dawn, Emil and Susan Doperya on Raven. Susan really knows how to cook a great dinner. On Christmas morning we all got together and had brunch on Northern Dream. I think we ended up with 11 people on Northern Dream. It was crowded but we had a great time and everyone got fed. Later in the day we went over to Joe and Peggy's power boat Crazy Notion for a Christmas dinner. There was around 15 people with room for a couple more. Power boats do have more room than sail boats, by the time we got back to RDreamz at about 9pm we were tired and ready for bed. With Christmas out of the way it's time to get everything put away for sailing. The next day I got all the Christmas decorations down and packed away for next year. Royce has been working on getting reefing lines installed on the main boom. There has been drilling going on all day. I hope it rains tonight and wash's all the metal shavings off the deck. It's too cold to hose the deck down. The boat has really gone thorough a lot of changes since we got to San Diego. Royce has installed full boat air conditioning, a fuel polishing system, more bilge pumps then I can count, the ham radio equipment set up and ready to go for email, solar panels and wind generator. There has been no grass growing under Royce's feet. We have really enjoyed our time here. It's been almost a year in the San Diego area. Royce has worked at the Chula Vista West Marine for most of that time. He may have complained about having to go to work but he sure enjoyed working with the people. Well I'll close here. I need to get back to packing things away. It's getting tight but I'll find a home for everything. I hope to keep my thoughts page going, so look for updates, as we get farther down the coast. At present we have Northern Dream and Raven going with us. First stop is Ensenada, Mexico. From there we don't know yet. Still waiting for the weather forecast to decide if we do an over night trip to the next port or find something closer. I'll let you know in the next update. Well I've put off setting down and writing my thoughts as long as I can. Here goes. When we got to San Diego it was love at first site. The weather was warm and dry. This was February so not shorts weather but still warmer then we were used to. We found a live aboard slip and got all settled in. Then it started raining. I felt like we were back in Washington State. It was still warm (in the 60's) but over cast and damp. We heard that it wasn't going to last that long. We had good days and we had bad days. It would give you a taste of what California weather is suppose to be, then it would take it away and we'd get wet again. Yesterday and today have been beautiful I'm hoping that June gloom is over. On the days that are not damp out I am laying decking. We had purchased tread master decking before we left Everett and had it stored below decks all this time. Laying this stuff wasn't to bad but the prep work was a bear. The deck had to be striped down to bright metal then a etching compound was painted then a top coating of paint and the next day the tread master was laid using a two part epoxy. Nothing is easy on a boat. I can do two squares at a time so it has taken a while to get done. I have three squares left and it's finished. Now I just have to get motivated to do it. My sister Mary is coming to stay with us for 10 days in July so I have been working on getting the V - berth all cleaned and painted for her arrival. I was doing pretty good getting everything put away till Lynn and Eric brought me two huge bags of sheets, blankets and pillows that we had lent them. Now I have to find a home for those things. Never a dull moment on a boat. Space is at a premium. I thought I had every space crammed full then I find I can cram just a little bit more. Now we find that we're listing to starboard. For those non- boat people that means that I put to much stuff on one side of the boat and now the boat is deeper in the water on that side. Royce is busy installing an air conditioner. That's going to be nice when we get to where it's really hot. Puerto Vallarta was 101 in February. We won't be able to run it all the time as it takes electricity, but we will turn on the generator to run it in the evening to cool off the boat so we can sleep. Till next time. At the age of 44 my life was looking so complete. A great marriage, 3 great kids and a job that paid well and wasn't the worst job in the world. My husband Bill and I had built our home on 5 acres and had just finished up with the construction the year before. Now was the time to start enjoying life. We had a motorcycle that we started taking trips on. Life was looking very good. What more could I ask for? The answer was nothing. Well life has a way of throwing a wrench in the works. In my case it was a very big wrench. In the summer of 1997 Bill and I took the motorcycle for a 2-week vacation to San Francisco. What a great time. We got a condo in downtown San Francisco and rode the trolleys every place. We were having such a good time we decided to take a side trip on the way home and stop in Reno Nevada. With our pockets just a little lighter we left Reno on the last leg for home. We got several miles into the Mt.Shasta area when my life would turn another direction. We were following a truck pulling a travel trailer with the speed limit being 55 m.p.h.. Bill signaled that he was going to pass and pulled into the left lane. At about the point where we could not change our minds about passing the truck, the truck turned left into a drive way. To make a long story short Bill was killed in the accident and I was sent to a nursing home with 7 fractures in my back. Recovery was hard but with the help of many good friends and my wonderful family I got through it. After I was able to walk again and I needed to take up a hobby. I was a couple of months out of a wheelchair and still needed a cane so I decided to take up scuba diving. Being disabled wasn't going to stop me. I was still pretty weak and needed more help getting my gear together but with a very helpful dive master I got through it. I had trouble walking but not so much swimming, my legs were weak and I was slower then some but I always got there. It's now January 1, 1999 and I was invited to a New Year Eve party. It was a small party of about 8 people. The host was a guy that had just retired from the Navy. His name was Royce. It was a great party and soon after we started dating. On January 1, 2000 he asked me to marry him, we married on February 14, 2000. At the time we were married I had a big house that Bill and I had build on 5 acres on Camano Island. My kids were leaving the nest and the house was just to big and to far out so we talked about what we should do once we sold the house. Royce was retired from 24 years in the Navy and had taught small boat handling for the Coast Guard. Me on the other hand had been on a couple of Ferries and that was about the extent of my boating. We talked of buying a boat some day and sailing to warmer places. More talk about warmer places and we started to really talk about buying a boat sooner. Then it was maybe we could live on a boat? The more we talked, the bigger the boat got. We placed the house for sale and bought a travel trailer to live in while we started looking for the perfect boat. We figured a year maybe two to find just the right boat. We had been living in the trailer one month when we went to look at our first boats. It was a Sunday and we stopped in at our local boat dealer. We were shown a couple of sailboats that had seen better days. Nothing special and really too small to live aboard. When we got back to the office we saw a picture of a 50' motorsailer that had a hot tub on the back of the boat. We had no intentions of buying a 50' boat in the first place as I had never sailed before and we figured start small and learn then go to a bigger boat. The thing was, how many chances do you have of going on a 50' sailboat that has a hot tub on it. So we decided to be looky Lou's and go over and look at it. The owner of the boat was on board and he gave us the master tour. The owner kept showing us more and more cool things on this boat. The more he showed the more we fell in love it. By the time we left the boat to go to lunch we were sold. The offer was taken; the broker came back with a handshake and said we had our boat. Talk about shock. What were we doing, a 50' sail boat! I had never even been out on a sailboat before. Well to make a long story short we got through the financing and insurance process with out too much headache. The next problem was finding out all the ins and out's of this sailboat. How does the head work? How do you start the engine? How do you change the anchor light at the top of a 65' mast? Learning to dock a small boat is one thing but learning to dock a 50' sailboat is something else. I have to hand it Royce he was very good at it. It didn't take him any time at all to get the hang of it. Of course there were several dockings that I was sure we were going to break the dock but they survived and so did we. A little paint and the wonders of a steel boat, all was well. In Oct. we moved aboard along with boxes and boxes of things that we didn't need on the boat. So we would haul all these boxes down to the boat then after stepping over them for several weeks we haul them all off the boat again. It's amazing what you can do with-out when you live on a boat. Why did I think I needed 20 coffee cups? Oh well you live and you learn you sail. We have lived on our boat for a while now. Removed tons of things we found we really didn't need on a sailboat, found more stuff that we really had to have on a sailboat. Did you know that the more stuff you bring on a boat the lower it sets in the water. Did you know that that colored strip on the middle of the boat is suppose to be above the water line? Well by the time we got everything we needed on board that red boot strip was well below the water. So now what do you do.... We moved the boot strip up 4 inches so it was out of the water. All better, as long as we don't bring on any more stuff. The date was set for our departure from Everett, Washington and my retirement. I turned in my notice for my last day at work as September 16th. We cut the final dock line on the boat and headed off to warmer climates that same day. There was no waiting for us, we were ready to go. Now this isn't to say that the boat was ready to go. We still had a lot of work to do. The one big job that we didn't really think was that big was the autopilot wasn't hooked up. No big deal right, we just have to hand steer. Well let me tell you it was a big deal. We were not just going out for an hour or two and stopping someplace to rest. We were traveling for hours and hours and in some cases days. It is hard on the arms and the shoulders and the back and the list goes on and on. Any way we ended up stopping at Brookings Oregon and installing it. What a difference. Take my advise if your planning on traveling any distance in a boat "GET AN AUTOPILOT". This is the only way to travel. We named the autopilot Bob. We had planned on buying a wind vane autopilot and naming it Not Bob, after some ducks I had. A wind vane type autopilot uses wind power to work. This would have been nice when sailing with out using the motor. We found after getting to San Francisco that our boat just was not set up for a wind vane autopilot. There would have been to many things we would have had to change to get it installed, so any way there is no Not Bob just Bob. The trip to San Francisco was very bumpy. From San Francisco to San Diego it was great. There were a few rough moments but all in all a much better ride then the trip from Everett to San Francisco. It has slowly gotten warmer as we got closer to San Diego. Once we got there it was wonderful, warm, sunny, dry, tee shirts and shorts kind of weather. This is the way to live. I could really get used to this. While we were safely moored for the holidays we went back to Everett to see my family for Thanksgiving then Royce's family for Christmas. It was great seeing everyone and I'm looking forward to the next trip in September.